The 2014 volleyball season was one to remember as the Mavericks recorded their best winning percentage since 2004 and most wins since 2006. The team went 25-9 (.735) overall and finished fourth in the Sun Belt Conference at 14-6 before losing in the conference tournament semifinals. The season featured the seventh longest home win streak at 10 matches and an eight-match overall streak, tied for the longest since 2002. Coach Diane Seymour believes the impact of seniors Ashley Bennett, Taylor Gross, Taylor Story, and Amanda Welsh will carry into next season. Bennett finished her career with 367 blocks to rank seventh in school history, and Welsh moved into sixth place in career assists with 3,517 and became the 15th player to serve 100 aces. Defense carried the Mavericks, who led the nation in digs per set for four weeks entering the Sun Belt Conference Tournament and finished the season with the NCAA’s second best mark at 18.16. 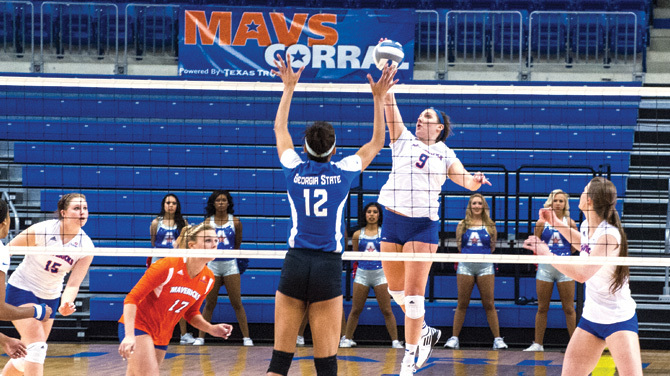 UT Arlington also ranked 24th in blocks and 27th in opponents hitting percentage. Two all-conference performers will return next season. Sophomore middle blocker Briana Sharratt registered 275 kills and a team-high 165 blocks to earn first-team honors. Freshman outside hitter Qiana Canete was a second-team selection, leading the Mavericks with 376 kills and finishing second with 480 digs. Also returning is junior libero Caitlyn Cooney, who recorded 671 digs, the second most in a season, and ranks 11th in career digs with 1,384.